Welcome to Amy Desautels-Stein’s online shop containing all of her current work for sale. All of the pieces here are made start to finish in her studio in Boulder, CO. She puts great care into handcrafting each and every individual piece. 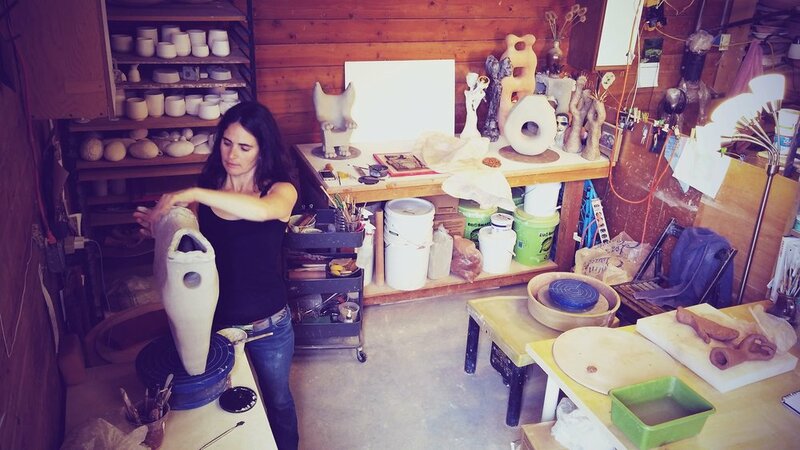 Amy uses on the potter’s wheel, as well as hand building techniques including coils and slabs to construct her work. She currently fires to cone 6 in an oxidation environment. Amy considers each piece to be unique; none will be identical. Keeping this in mind, all measurements are approximate and within sets, each item varies slightly.One of the great joys for Amy in creating each piece individually is that each item takes on qualities of its’ own, and is imbued with its’ own spirit. She sees variations as enhancements making each of her pieces one of a kind. Items may be placed in the microwave and the dishwasher. Amy does consider requests for special orders based on items she is currently working on. If you see something you like on her site that is not currently in her shop, please feel free to contact her regarding making something similar. In the spirit of her work, she does not replicate past pieces exactly. There may be a custom fee added to the cost of the piece, depending on what you are asking for and a non-refundable deposit of 50% of the item is required. The balance and shipping costs are due before the item is sent. Based on Amy’s current studio schedule, custom orders take 2-4 weeks to complete. Amy will keep you up to date about the progress of your order. In some cases, Amy may decline your request depending on a myriad of factors, but never hesitate to contact her. In most cases, items will ship within 3-5 business days. Ceramic wares take many materials, much care, and time to pack in order to ensure they arrive to you undamaged. Whenever possible, Amy reuses packing materials and strives her best to pack with items that leave the least environmental impact. Please keep in mind, this is a one woman operation. If you are in a rush, contact Amy to discuss expedited shipping options. She ships though the USPS to offer you the most economical option. Currently, Amy is only shipping domestically in the United States. If you are in the area, you can forgo shipping costs by typing “LOCAL” into the shipping option box [if this is possible] and arrange to pick up at Amy’s studio.